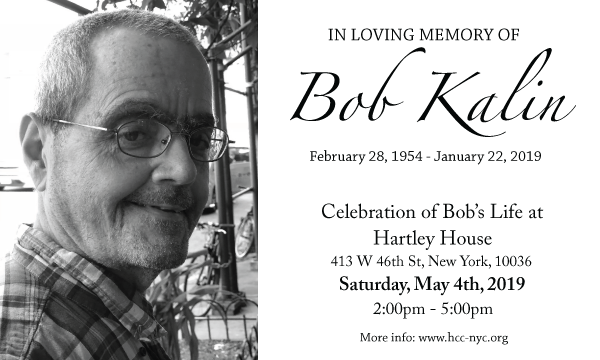 HCC mourns the sudden loss of Bob Kalin, our longtime tenant organizer, advocate, and friend. Bob was a pillar in the tenant community and the backbone of HCC. Bob joined HCC in the 70’s as a tenant organizer. Over the decades he worked with tenants in substandard buildings that were owned by slumlords. As the neighborhood changed, Bob continued to advocate for tenants as they faced adversity and harassment from landlords and developers in the wake of gentrification and displacement pressures. Bob felt strongly that housing activists cannot be advocates for others until they are first advocates for themselves. To this end he was one of the founders of the union at HCC, which was the first nonprofit community housing group in the United States to unionize. Bob has trained dozens of tenant organizers at HCC and trained advocates and tenants throughout the City for years including a highly regarded and popular training on HP Actions. In recent years Bob developed a plan of action to help elderly tenants to clean out their cluttered apartments to avoid evictions. Bob worked tirelessly and without seeking fanfare. Bob's passionate advocacy, fountain of knowledge, mentorship, wit, love of music, and presence will be deeply missed. He passed away in a remote area in the Philippines doing what he set out to do in his later years – travel, walk, meditate, and meet people. At HCC we're committed to keeping our neighbors warm and safe! For over 45 years, Housing Conservation Coordinators has remained steadfastly committed to developing programs to meet the immediate and emerging needs of our most vulnerable neighbors. Seniors, immigrants and low-income tenants can turn to us for high quality legal services and advice; participate in our Weatherization Assistance Program to reduce energy use and costs; or benefit from HCC's affordable housing advocacy. HCC offers hope in times of crisis to families in need. We would be grateful for your support at this critical time for our community. We hope you will join us in ensuring every New Yorker has a safe, affordable home by making a year-end contribution. Click here to see our Journal. 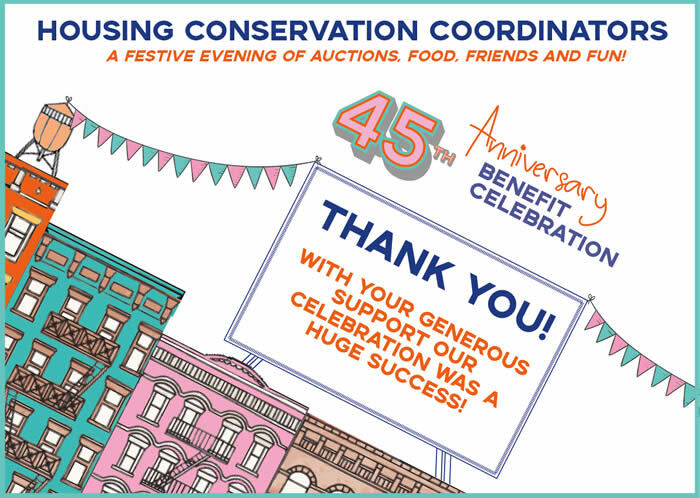 Founded in 1972, Housing Conservation Coordinators is a legal not-for-profit organization that seeks to preserve safe, decent and affordable housing on the west side of Manhattan. Each year, HCC provides legal services, tenant and community organizing, and weatherization assistance to thousands of neighborhood residents keep their homes, improve their living conditions, and fight for the changes that will keep our neighborhood affordable and diverse for years to come. Please explore our web site, call us at 212-541-5996 or visit our 777 Tenth Avenue office to find out more about our services and join our efforts to preserve decent and affordable housing on Manhattan’s West Side. New! Housing Links: Online resources for tenants and housing advocates! Click on link for additional information. Ongoing! Free legal help for Immigration related issues. Clinic Dates: Normally the first and third Wednesday of the month, unless otherwise noted. For additional information please call the number below. Para más información o para hacer una cita, por favor llamar el número de abajo. al menos que allá cambios.